Toronto, Ontario--(Newsfile Corp. - March 1, 2018) - Royal Road Minerals Limited (TSXV: RYR) ("Royal Road" or the "Company") reports on drilling results from its recently completed 9-hole reverse-circulation drilling program at its Piedra Imán copper-gold project in northeastern Nicaragua (see Table 1). The Piedra Imán concession area is located in Chinandega District, 200km northwest of Managua via the Pan American Highway. The project forms part of the Company's 50-50 strategic alliance with local partner Hemco, a subsidiary of Grupo Mineros S.A. Colombia's largest gold producer (see press release September 6, 2017). Piedra Imán is a copper and gold project which shares many geological similarities with "cordilleran-style" Iron Oxide Copper Gold (IOCG) systems such as those which occur in Chile and Peru. The Piedra Imán project was initially explored in the early 1970's by Noranda Inc ("Noranda"). Noranda's work included the drilling of 17 shallow diamond drill holes and the development of one exploration adit. Noranda's drilling and underground sampling intersected significant widths of copper mineralization including DDH-851 (36.6 meters at 1.13% Copper), DDH-876 (14.8 meters at 1.65% Copper), DDH-846 (14.3 meters at 1.42% Copper) and DDH-818 (9.1 meters at 1.50% Copper). Samples were only sporadically assayed for gold, but drilling results included one interval of 3.6 meters at 6.3 grams per tonne gold. Channel results from underground sampling are reported to have returned best results of 52 meters at 6.2 and 50 meters at 6.4 grams per tonne gold. These results were provided in analogue format, compiled by Royal Road, are historic in nature and have not been verified by a qualified person. Noranda abandoned the project due to the onset of hostilities related with the Sandinista revolution in 1974. Results from this drilling program include best intersections of PI-006; 8 meters at 9.3 grams per tonne gold and 31 meters at 0.5% copper, PI-008; 103 meters at 0.36% copper and PI-007, 40 meters at 0.38% copper (see Table 1). Gold and copper mineralization are hosted in the same magmatic breccia but are spatially distinct, with gold generally occurring structurally below the copper mineralization (see Figure 1). Gold mineralization is commonly related with molybdenum and accompanied by albite, actinolite, tourmaline and magnetite. Gold mineralization appears to be superposed on the overlying copper-mineralization which is generally accompanied by potassium feldspar. The occasionally high-grade (up to 70.5 grams per tonne) and irregular distribution of gold in duplicate sample results suggests that it is coarse in nature. "These drilling results failed to confirm the copper intersections reported by Noranda in the early 1970's and have revealed that higher grade gold is not spatially related to copper mineralization," said Dr Tim Coughlin, Royal Road's President and CEO. "The Royal Road-Hemco strategic-alliance is focused on discovering and developing significant resources in excess of two million gold or gold-equivalent ounces. 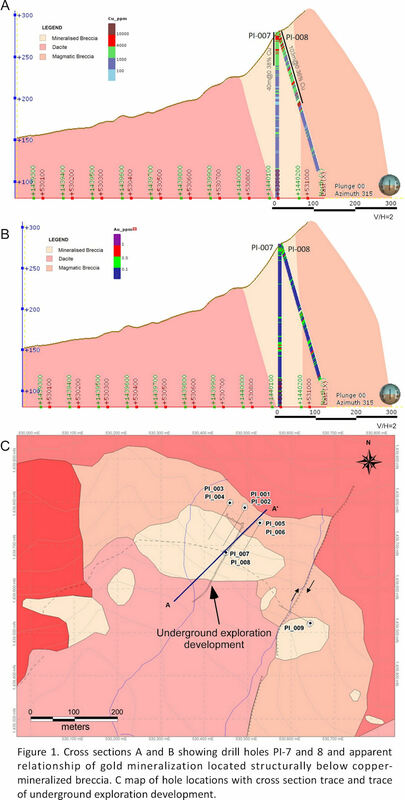 Whilst the geological style of mineralization at Piedra Imán is promising, these new drilling results suggest that the project would only meet our target criteria should the system we have been testing reside above and/or adjacent to a more coherent and higher-grade gold or copper-gold mineralized body. We intend to test this hypothesis quickly and cheaply by seeking permission to reopen Noranda's historic underground exploration development and resample the underground channels where Noranda have reported significant gold grades over long intervals. In terms of further drilling, the strategic alliance will now focus its attention on the porphyry copper-gold target at Los Andes." This news release contains certain statements that constitute forward-looking information and forward-looking statements within the meaning of applicable securities laws (collectively, "forward-looking statements") including e statements relating to the Alliance and those describing the Company's future plans and the expectations of its management that a stated result or condition will occur. Such forward-looking statements involve known and unknown risks, uncertainties and other factors that may cause the actual results, performance or achievements of the Company, or developments in the Company's business or in the mineral resources industry, or with respect to the Alliance, to differ materially from the anticipated results, performance,achievements or developments expressed or implied by such forward-looking statements. Forward-looking statements include all disclosure regarding possible events, conditions or results of operations that is based on assumptions about, among other things, future economic conditions and courses of action, and assumptions related to government approvals, and anticipated costs and expenditures. The words "plans", "prospective", "expect", "intend", "intends to" and similar expressions identify forward looking statements, which may also include, without limitation, any statement relating to future events, conditions or circumstances. Forward-looking statements of the Company contained in this news release, which may prove to be incorrect, include, but are not limited to, those related to the Alliance, Hemco, and the Company's plans exploration plans. The Company cautions you not to place undue reliance upon any such forward-looking statements, which speak only as of the date they are made. There is no guarantee that the anticipated benefits of the Alliance and the Company's business plans or operations will be achieved. The risks and uncertainties that may affect forward-looking statements include, among others: economic market conditions, anticipated costs and expenditures, government approvals, and other risks detailed from time to time in the Company's filings with Canadian provincial securities regulators or other applicable regulatory authorities. Forward-looking statements included herein are based on the current plans, estimates, projections, beliefs and opinions of the Company management and, in part, on information provided to the Company by Hemco, and, except as required by law, the Companydoes not undertake any obligation to update forward-looking statements should assumptions related to these plans, estimates, projections, beliefs and opinions change.